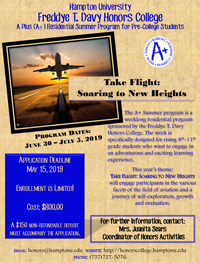 The A+ Summer Program is a weeklong residential program sponsored by the Freddye T. Davy Honors College. The week is specifically designed for rising 8th – 11th grade students who want to engage in an adventurous and exciting learning experience. This year's theme will engage participants in the various facets of the field of aviation and a journey of self-exploration, growth and evaluation. Cost: $800.00. Includes the full week's housing, meals, activities, and supplies. Applications may be downloaded and retuned electronically or by mail. A $150 non-refundable deposit must accompany the application. Fees may be paid by money order or cashiers check, or with a card by calling the Hampton University Cashier's Office at (757) 727-5663. For further information, contact, Dr. Rikesha L. Fry Brown, Hampton University Honors College Director and A+ Program Director, or Mrs. Juanita Sears, Coordinator of Honors Activities at 757-727-5076.